Titan is the largest of planet Saturn’s moons. It is the second largest in the solar system with a diameter of 3,200 miles. It is the only moon in the solar system that has clouds and a dense atmosphere. It consists mainly of 95% nitrogen and the remaining 5% is made up of 3% methane and 2% hydrogen. 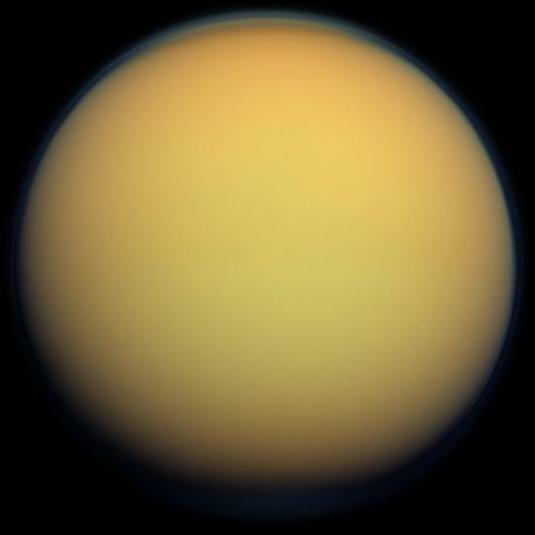 Titan has many methane lakes that are mainly concentrated near the southern pole. These liquid lakes make it the only other world in the entire solar system that has stable liquids on its surfaces. Titan takes approximately 15 days and 22 hours to complete a full orbit of Saturn. Similar to other moons around their primary planets, it has a rotation period the same as its orbital period. This moon is about 759,000 miles away from the planet Saturn. Sunlight takes about 80 minutes to reach here. Up until now, only one space probe has visited its surface, the Huygens Lander which arrived on January 14, 2005. Titan is one of those 62 moons of Saturn that have been confirmed to have proper orbits. This moon was discovered on March 25th, 1655 by Christiaan Huygens. It was discovered by NASA’s Cassini spacecraft that its surface has rivers and lakes of liquid ethane and liquid methane. Its composition is known to be water ice over a rocky interior. Repeated fly-bys of this moon have shown that its surface rises and falls by as much as 10 meters during a single orbit. This is also the reason why its shape changes measurably during its orbit. Declan, Tobin. " Amazing Titan Facts for Kids ." Easy Science for Kids, Apr 2019. Web. 26 Apr 2019. < https://easyscienceforkids.com/titan-facts/ >.